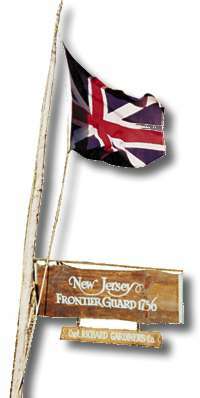 Two decades before the American Revolution, the Royal Province of New Jersey prepared itself for the culmination of 70 years of bickering between the French and the English colonists. The French armies and their Indian allies, intent on protecting their vast trading interests in the New World, advanced on the western frontier of the British domain. At Fort Duquesne, near modern Pittsburgh, the French flanked the British General Braddock, killing him and more than half of his men, setting off Indian raids throughout the Colonies. The Delaware, still enraged by the fraudulent Walking Purchase of their lands in 1737, and encouraged by their new advantage, threatened colonial settlements in New Jersey. During the French and Indian War that followed, New Jersey sent its provincial regiment, the "Jersey Blues," to battles at Oswego, Ticonderoga, and Lake George. At home, the Frontier Guard, created by Governor John Belcher in 1756, defended the western settlements of the newly formed Sussex County. A tour of duty in the Guard lasted 30 days, and consisted of ranger style patrols of 6 to 8 men between the chain of thirteen forts in the Upper Delaware Valley wilderness known as the Minisink; from Fort Redding at present day Belvidere to Fort Gardiner, north of Port Jervis. Recruits were seasoned woodsmen over the age of 21 (regular militia began at 16), and came from all walks of life, including slaves and indentured servants. Members wore civilian attire; no two looked the same; and were required to equip themselves with musket, powder horn, hatchet, blanket and knapsack. The Frontier Guard were not "toy soldiers" and represented a fiercely self reliant force, adaptable to the expanded challenges of an already hostile environment. After the seven years war, the group disbanded. Today's Frontier Guard protects the figurative frontier by meticulous research, publishing, and public reenactment of historical events. Doug Pitchell, who founded the modern-day group in 1991 with 6 members, explains, "Interaction with the public is the biggest thing. Most people think American history started with the Revolution and have no idea about the French and Indian War. Even teachers that see our group are amazed that their 'facts' are often wrong." There is no documented evidence of a New Jersey Frontier Guard encampment. In fact, very little written material exists regarding New Jersey in the seven years war. However, there is a wealth of detailed information about tentage, utensils, conveniences, and tools which would have been common in a period ranger camp. Pitchell continues "The problem is that stuff you see today usually consists of things that weren't used alot in their day. That's why artifacts are suspect, in as much as most people of that period had so little, everything was used until it was exhausted. For instance, fabrics were recycled from clothing to quilts to rag rugs until they were worn into dust." Research is conducted through a variety of methods ranging from rigorous academics and archaeology to "experimental anthropology." While each member is required to contribute some scholarly sweat, the hands-on experiences while on patrol often lead to the most valuable conclusions about what actually worked in the eighteenth century New Jersey woods. Members make their own buckskin breeches, moccasins, belts, scarves, sleeve and knee straps, and headgear from scratch. Personal items used in camp could include a sharpening stone, jew's harp, sewing kit, coin pouch, gaming dice, fleam, pipe, tobacco pouch, and various other useful diversions. On patrol, a fishing kit, spyglass, compass, and folding skillet would be very handy. Cooking equipment includes dozens of items, including axes for firewood, spice bottles, firepit grates, iron stands, saws, knives, gloves, tinder, fire boxes, cooking pots, clayware jugs and platters, wicker serving baskets, pewter plates and bowls, tin and copper furnishings, tables, chairs, and occasional items such as squirrel-roasters. In addition to muskets, all the utensils necessary for their operation; powder horn, a powder measure, shot or ball bag, flint wallet, screwdriver, touch-hole pick, knapping hammer, ball-screw, rod-puller, cleaning worm and tow, lead ladle, bullet mould, and perhaps a quantity of extra lead; were essential components in the personal arsenal of the day. These, and additional weaponry, are often fashioned by specialists within the group. Each member, in fact, contributes a particular skill, usually according to his own real life professional orientation. 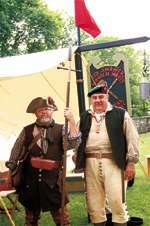 Portraying the specific contribution of the Frontier Guard is part of the group's larger objective to inform people about what life was like on the New Jersey frontier. Issues and discussions are formalized, and happily shared, on the group's website, which provides an invaluable bibliography and set of links for anyone interested in that period of history. But the best way to get a feeling for frontier America is to see for yourself. The Guard, which now consists of 28 men, women and children, appears at over 40 events each year, at state parks, Waterloo Village, Shippen Manor in Oxford and schools throughout the area. "Being a member of the Frontier Guard consumes alot of time; it becomes a way of life," says Pitchell. "Why you do it is because you see what people have done in years gone by and see how terribly spoiled we are as a society. Do we really need all the excesses? It yields a fonder appreciation for everything that we have." The New Jersey Frontier Guard schedules regular appearances in the area. 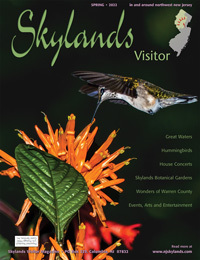 For more information please call 908/709-4087.